Brooklyn Comes to Westport, a group exhibition featuring works by Brooklyn-based artists Anna Ortiz, Barry Rust, Juan Fontanive, Katelyn Alain, Phoenix Lindsey Hall, Ryan Blackwell, Stephanie Beck, and Tifenn Python. Anna Ortiz, is a painter originally from Worcester MA lives and works in Brooklyn NY. She studied Art History and Painting at Tufts,The School of the Museum of Fine Arts Boston and the Louvre. Ortiz completed her MFA studies in painting at Tyler in both Philadelphia and Rome. Her work has been exhibited in New York, Boston, Rome and Philadelphia. She was the recipient of the Future Faculty Fellowship at the Tyler School of Art as well as the Vermont Studio Center Fellowship. 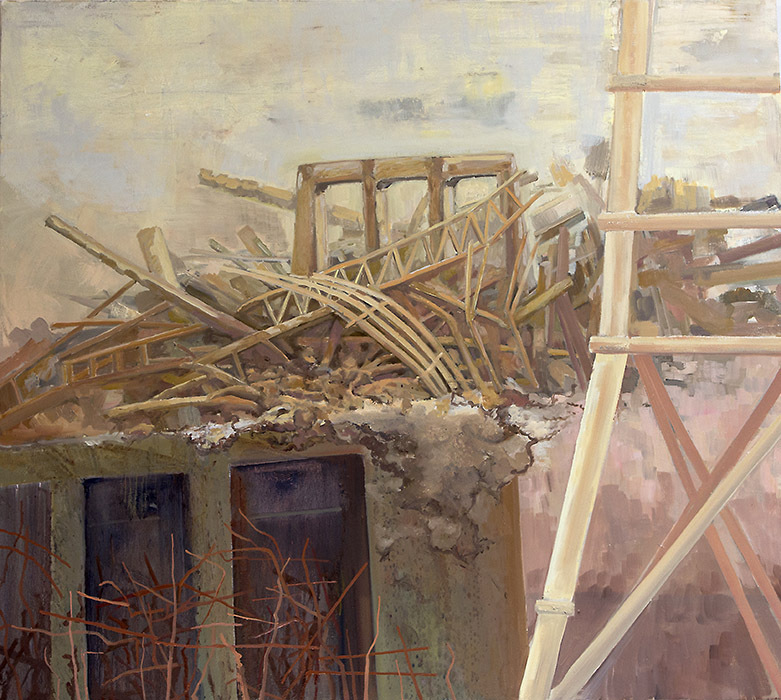 Anna Ortiz's latest body of work depicts a world caught between construction and wreckage. Inspired by current events, Ortiz builds her landscapes out of news headlines, history painting and her personal experience. Through fragments of her invented world, Ortiz asserts painting's potential as a hypothetical lens for considering global issues. Oscillating between abstraction and representation, Ortiz's use of spatial compression and filtered palettes emphasize the uncertainty of these otherwise familiar landscapes. These are simultaneously impossible worlds built out of paint and yet somehow plausible alternate realities. Barry Rust was born in Illinois and grew up loving music. Years later he became fascinated with the variety of instruments used in American folk music. 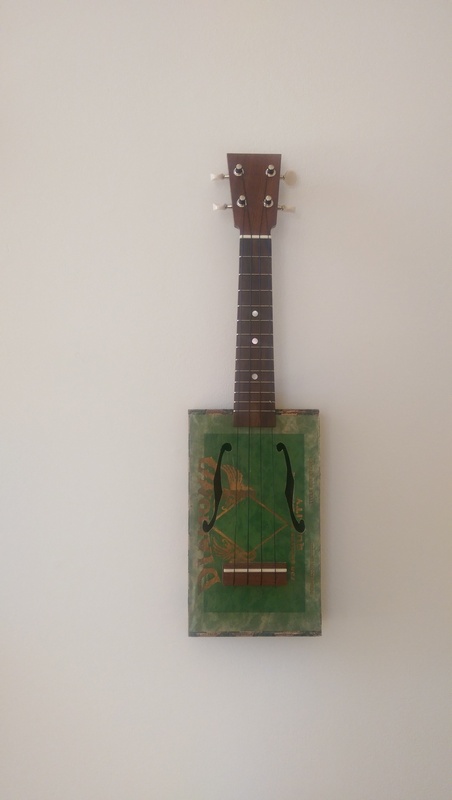 He began a collection and eventually decided to build himself a ukulele out of a cigar box his dad once used to hold model train parts. Barry spent a few years fine tuning his process. 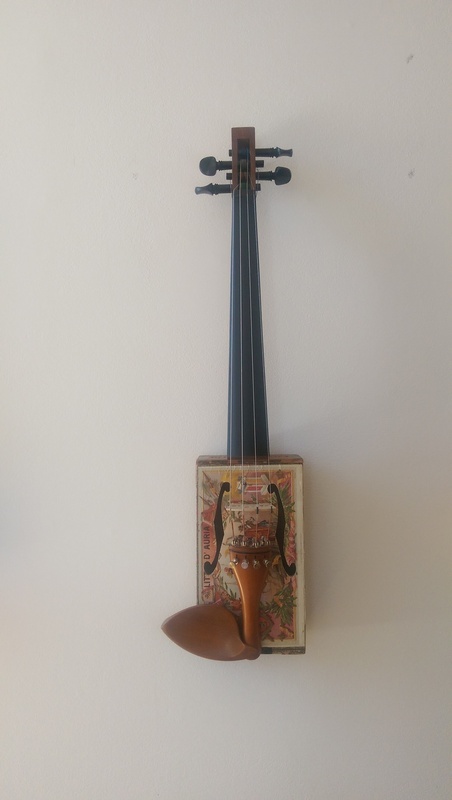 Now he sells fine craft instruments to collectors around the country as Great Plains Handmade Instruments. 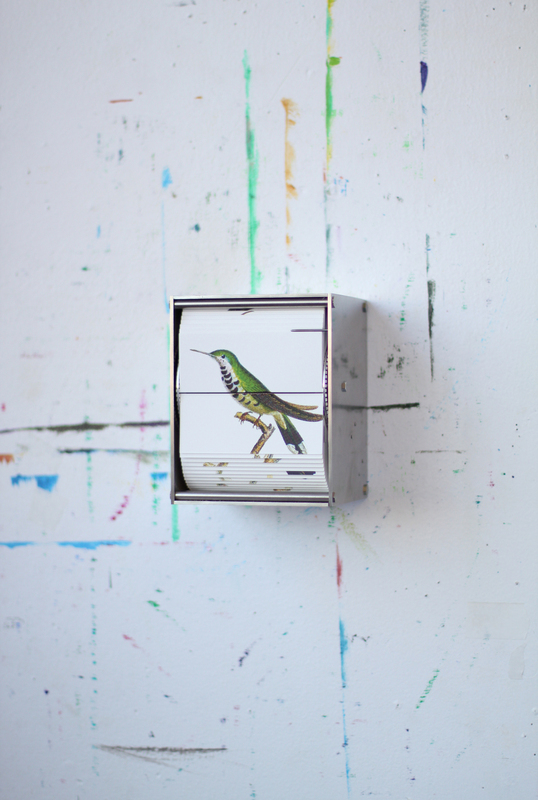 Building on a long tradition, I create musical instruments from vintage cigar boxes and tins. 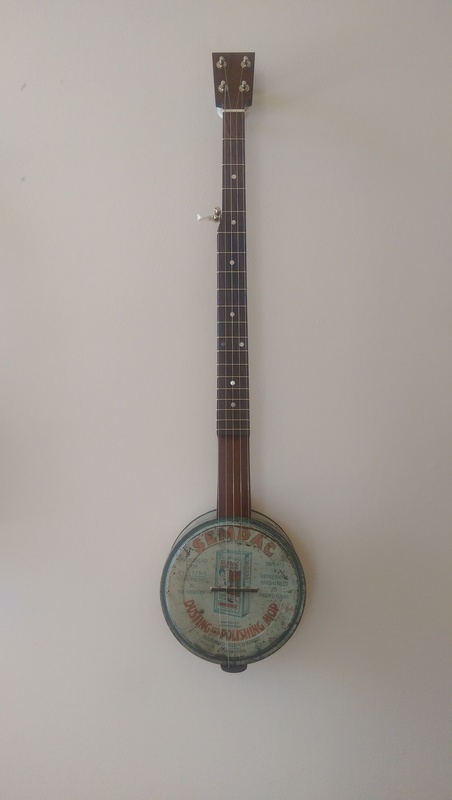 As banjos, ukuleles, and fiddles, these repurposed objects are given a new life and utility--but they still carry clear marks from their histories, giving us the opportunity to reflect on culture and our connections to the past. At the same time, these instruments allow us to consider on how we use up and dispose of resources, often destroying value that may remain. 2007 Bank Street College of Education, MEd. Juan Fontanive was born in Cleveland in 1977. In 2006 he received his master’s degree from the Royal College of Art, London. He has exhibited at The Royal Academy of Art, London, Contemporary Art Society, London, Limerick City Gallery of Art, Ireland, The New Museum window, New York, The Biennale Internationale Design, Saint-Etienne, France, The Kinetica Museum, London, and The Centro Cultural Banco Do Brasil, Rio De Janeiro. He has won awards including the Desmond Preston Prize for Drawing, the Louise Wetherbee Phelps Award, and shortlist of the Jerwood Painting Prize. I create machines that combine moving objects with moving images. They attempt to explore the unsaid of imagery related to movement, color, and sound. The work is founded in the moving image — and infuenced by shutters, reels, and black and white flickering. Responding to the lack of movement found in our current digital age, I'm interested in actual movement in relation to virtual. My work longs to free images, and tries to form a language to explore the vividness of living things. Born in 1979 in Newton, MA, Katelyn Alain studied painting at Hartford Art School receiving a BFA in 2001 and an MFA in Studio Art from the University of Wisconsin-Madison in 2008. She attended the Marchutz Painting School at the Institute for American Universities in Aix-en-Provence, France and was a resident at the Vermont Studio School. She currently lives and works in Brooklyn, NY. Alain has held four solo exhibitions including her most recent, The Age of Illuminated Phenomena at Skotia Gallery, Santa Fe, NM (2009) and has been curated into many group exhibitions across the country. Musing, at Arcilesi Homberg Fine Art (2015) was her first two-person exhibition in New York. Her work has been featured in publications including The Wall Street Journal, American Art Collector Magazine, Modern in Denver Magazine, and Studio Visit Magazine. She is currently sponsored by Grumbacher paints. When ideas come to me they are vivid, alive, and affecting. Painting enables me to use these internal images as a jumping off point to document my perceptions. I am after a more personalized realism where the paint also describes what has been altered and romanticized by the brain. There is an element of magic in the way we remember and perceive, especially with memories that leave an imprint over time. I am in awe of the power we have to alter and elevate our experiences. It is my goal to express and articulate the enchanted workings of the brain in order to be more faithful to my actual experience of life, memory and thought. The act of painting with oils enables me to reconstruct a more vital and authentic version of my reality; a kind of internal timeline made visible. Phoenix Lindsey-Hall is a Brooklyn-based mixed media artist. Lindsey-Hall holds a MFA in Photography from Parsons The New School of Design in 2012 and a BFA in Photography from Savannah College of Art in 2004. Lindsey-Hall has had solo shows at Christopher Stout Gallery (Brooklyn, NY) Brown Gallery at Duke University (Durham, NC), Gallery Aferro (Newark, NJ) and shown in group shows in various galleries in New York, NY, Philadelphia, PA, Louisville, KY, Savannah GA and in Pingyao, China. She is New York Art Residency and Studios (NARS), Studio Residency Recipient, and a participant in the Emerge Program with the Aljira Center for Contemporary Arts in conjunction with Creative Capital. Her artwork centers on themes of violence, sexuality and domesticity. I am a project-based artist working from research about social problems and cultural issues. My most recent work is an exploration of queer hate crimes. Using white ceramic slip, I transform everyday objects that have been used as weapons in hate crime cases. Similar to crimes of passion, these makeshift weapons point to the urgency and intimacy in this violence. I intentionally deform the weapons, replicating the body in trauma. Exploring themes of violence, loss and the dangers of domestic spaces, my work points to the fragility of life not just for sexual and racial minorities, but for us all. Stephanie Beck’s work plays with ideas of architecture and constructed space through cut paper sculptures, installations, and public art events. Stephanie has an M.F.A. from the Pennsylvania Academy of the Fine Arts, a post-baccalaureate degree from the School of the Museum of Fine Arts, Boston, and a B.A. from the University of Virginia. Select recent exhibitions and projects include solo public art events in Istanbul, Turkey and Fort Collins, CO;, a two-person exhibition at Musee d’art Modern Andre Malraux, Le Havre, France; group exhibitions at The International Print Center of New York, NY; Cite de ‘l’architecture et du patrimonie, Paris, France; The Visual Arts Center of New Jersey, Summit, NJ; AIR Gallery, Brooklyn, NY; and Fort Collins Museum of Art, Fort Collins, CO. Stephanie has attended artist residencies at the Museum of Arts and Design, New York, NY; in Le Havre, France; at The Center for Book Arts, NY; Triangle Arts Association, NY; ART342, Fort Collins, CO; and Caravansarai, Istanbul, Turkey. Stephanie has received an Emergency Travel Grant from the Foundation for Contemporary Arts and a Joan Mitchell MFA grant. Stephanie also collaborates with dance/theater company, Racoco Productions, on set and prop design, and has worked on performances and installations at spaces throughout New York City, including Incubator Arts, CAVE, chashama’s Summer Performance Series, and at the Strand Theater in Plattsburgh, NY. I am interested in exposing the fragility and transience within the seemingly static architecture of the public and private spaces in which we live. I see buildings as surrogates for ourselves and work with them to investigate and illustrate our human characteristics. I draw inspiration from my immediate environment and distill the buildings and structures I see into simplified forms that I then rearrange to create new interpretations of form, space, and movement. I explore this process through cut paper maps, installations, public events, and collaborative dance performances. Hanging Towers #1-5 combine the verticality of the incredibly tall buildings currently being constructed in New York City with the skeletal framework of the shipyard cranes that surround my studio in the Brooklyn Navy Yard. The Hanging Towers reference the cranes’ ability to lift and lower heavy machinery, adding movement and weightlessness to what are normally inert, heavy forms.